Which of these Greek yogurts is your favorite? I decided to taste them all and try to determine which one is the best. I stayed away from brands that you cannot find nationwide (and I am sure I will hear about that choice in the comment section). I bought these yogurts because they didn’t have artificial sweetener (which I can’t stand) and they were all strawberry. Also, they are all non-fat because they are the easiest to find. I prefer 2% (because I think it tastes better) but I can never find it. When I brought these six yogurts home, my children went bananas and asked to be taste testers (as did my husband). My husband, 7 year old, and 10 year old tasted these without knowing the brands (blind). I was in charge – so I knew the brands. We did “clear our palates” after tasting each yogurt. 5. Dannon Oikos $1.19 – 120 calories – This one tasted like cough medicine and had a good texture but not as thick as Greek yogurt should be. 4. FAGE fruyo $1.79 – 140 calories – Very chalky and had a strange flavor but it was thick (like a real Greek yogurt). 3. Stonyfield Organic Greek $1.99 – 120 calories – This one is pretty good. It has a good texture and is slightly chalky. The strawberry taste was a little strange. 1. Yoplait Greek $1.00 (on sale) – 140 calories – I couldn’t find strawberry so this was a blend of strawberry and raspberry. This had a very good flavor but isn’t very thick. It does have 11 grams of protein and the ingredient list is clean. This was my son’s favorite. I hate to say it but NONE of these could hold a candle to plain yogurt (or plain Greek yogurt) with some jam mixed in or FAGE (the regular one). They all had a chemical aftertaste and my husband decided he hated them all. If you stop eating these types of processed yogurts (as he has) – you notice the strange flavors. Which is your favorite? Please share your ideas on good yogurt. I love Dannon Light & Fit Greek Yogurt, Toasted Coconut and Vanilla flavor. It's 80 calories, 12 gms protein, 7 gms sugar. Good stats and flavor. I can't eat plain yogurt yet and this give me benefits I need. The only downside is that it does leave me hungry for more. 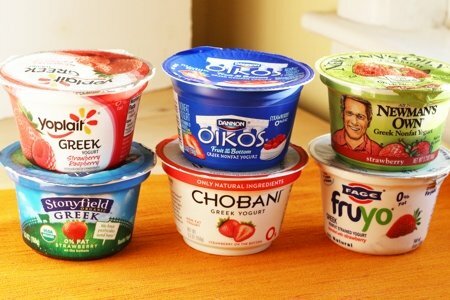 I still love Chobani - I have tried many - not all of these you have listed, but some if these and others. Chobani does mot taste chalky to me. Several of the Greek yogurts are good to me. I may try some of these as well- it must be a personal taste preference kind of thing! Fage ("Total") 2%. Plain. I don't worry about the small amount of fat and it tastes so much better than the 0%. And no chemicals or nasty ingredients. I don't eat the flavored ones anymore, but when I used to, I would buy the Fage 2% with strawberry or honey. You can also just buy the plain and mix in your own. I prefer plain yogurt with fresh fruit mixed in and sometimes honey. I very rarely eat flavored yogurt because of the strange tastes you mentioned. I'm glad to see there are several options with natural ingredients though for people who still like the flavored yogurt. I like Yoplait light strawberry cheesecake. I love the flavor. I'm going to try plain with jam, as you suggested. Love that idea. I agree with you that plain with jam is the best. I like fig jelly in mine. I did taste tests with all the lemon yogurts I could find and liked Stonyfield the best. The others were chemical tasting or too sweet. Here in Ontario we have SOURCE Greek Yogurt 2x Protein by Yoplait - 50 Calories and endorsed by Weight Watchers. It's thick and creamy, maybe from gelatin, but not from cornstarch! I hate flavored yogurt! I'm not sure when that happened - and every once in a while I forget or think "this flavor will be different" (like the blood orange Chobani), but no. I'm a plain Fage girl, all the way. Used to do plain Chobani but once I tried Fage (usually 2%, occasionally full fat), I never went back. It's so rich and delicious. I don't even sweeten it that often, just add fruit or oats (and sometimes use it as a sour cream sub, although I do buy sour cream on occasion). I loved your idea in the book to use jam in plain yogurt, so I recently made a phenomenal bowl of PB & J oats: cooked my oats, swirled in a tbsp or so of creamy PB, then topped it with cherry preserve-laced Fage. OMG, delicious!!!! I don't usually even like PB & J sandwiches or that combo in general, but this was divine. Love the comments from your family. My favourite is silhouette greek yogurt. I find it is like eating pudding (which is a great) I like to semi freeze it and than it is like ice-cream, but a lot less calories. With so many choices, and new greek yogurts coming out I appreciate the feed back. I will try some of the ones mentioned and have a little test tasting of my own. By the way, love your book too!!!! I would have to say Dannon Light&Fit GREEK with 80 calories and 12 grams of Protein is by far the best tasting Yogurt on the Market.I like it for low Sugar and double the Protein. A cup of this Greek yogurt with ground up raw Almonds, Pistachios,Walnuts, and Cashews sprinkled on top really make a great breakfast or filling snack at any time. I ALWAYS get Fage 0%. That way I can do whatever I want with it.I LOVE it! I love Dannon Light & Fit Greek Yogurt! Their flavors are sooooo good and I used to not light Yogurt because when I ate a few bites I felt like gagging. However, these are so good!!!! Yoplait greek is my favorite -in lemon..and it is WW approved.. I like Taste of Inspirations Greek yogurt. The blueberry is my favorite but nothing beats plain Greek yogurt with fresh fruit. Another Light & Fit Greek fan here. It does contain a small amount of sucralose, but it doesn't taste suspect. (I too detest artificial sweeteners and gag at the thought of a diet coke) I'm pretty sure it's the only product I consume with artificial sugar, so I'm not too concerned. I buy the plain Oikos Greek yogurt. I have it with honey and cinnamon. Or fresh fruit mixed in. It's nice and creamy. Dannon Light & Fit coconut vanilla. The BEST!It is rich and creamy and tastes like a decadent treat.